The binomial and trinomial cubes are introduced early in a Primary classroom. As part of the sensorial area, the carefully designed cubes allow the child to put together the color coded pieces like a puzzle. The child is able to see the shapes and number of pieces it takes to complete the cubes. Because of the color coding, the child’s attention is indirectly drawn to the different dimensions of the pieces. 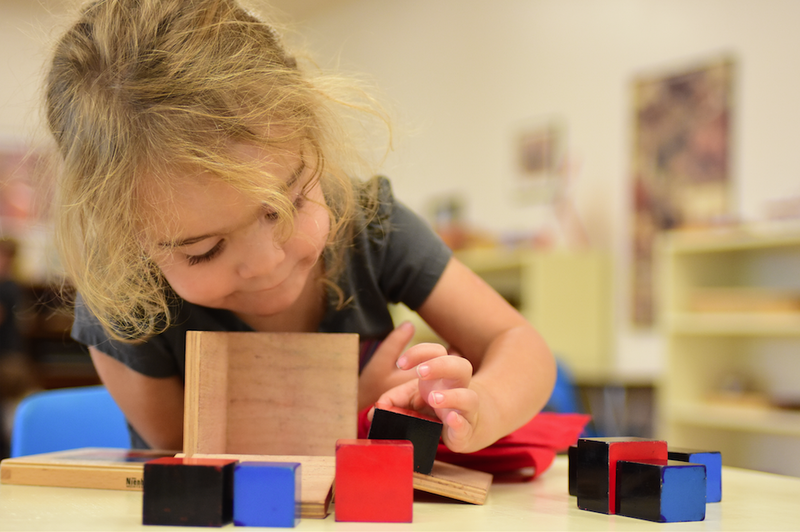 The child develops an awareness of and confidence in building the cubes through working with and exploring the material. The elementary child also works with the binomial and trinomial cubes, but with a new layer of understanding and awareness. The binomial cube is introduced as the concrete representation of (a + b)3 . The value of each piece is represented by the unique dimensions of the pieces, which are named at this level. The child is able to see the binomial square illustrated on the box cover and see that it is then multiplied by (a + b) to give the cube. Through this experience, the child is aware that a binomial cube has eight pieces, two of which are cubes. When the child computes the mathematical process of (a+b)3 = a3+3a2b+3ab2+b3, the equation makes sense. The student is able to name each of the pieces using the variables and gains confidence that math is real. Copyright © 2019 Mountain Shadows Montessori School. Powered by WordPress. Theme: Spacious by ThemeGrill.